Nixplay Iris frame makes it easy to get in touch with your photos. 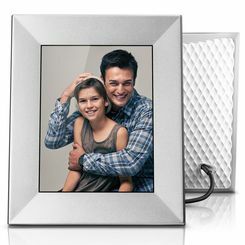 Allow friends and family to share photos to the Nixplay Wi-Fi Frame from anywhere in the world. The perfect gift to bring a smile to loved ones: Capture moments and display them instantly using the Nixplay Mobile App for iPhone & Android or email them directly to the Nixplay Iris Frame.